Dette er en omfattende biografi om Ernest Miller Hemingway liv, samt analyse og sammenligning av E. Hemingway og hans noveller. 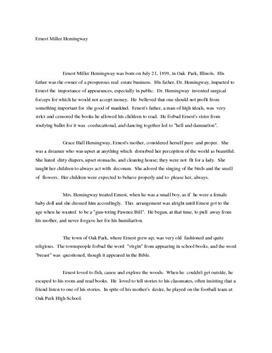 Ernest Miller Hemingway was born on July 21, 1899, in Oak Park, Illinois. His father was the owner of a prosperous real estate business. His father, Dr. Hemingway, imparted to Ernest the importance of appearances, especially in public. Dr. Hemingway invented surgical forceps for which he would not accept money. He believed that one should not profit from something important for the good of mankind. Ernest's father, a man of high ideals, was very strict and censored the books he allowed his children to read. He forbad Ernest's sister from studying ballet for it was coeducational, and dancing together led to "hell and damnation". Grace Hall Hemingway, Ernest's mother, considered herself pure and proper. She was a dreamer who was upset at anything which disturbed her perception of the world as beautiful. She hated dirty diapers, upset stomachs, and cleaning house; they were not fit for a lady. She taught her children to always act with decorum. She adored the singing of the birds and the smell of flowers. Her children were expected to behave properly and to please her, always. Mrs. Hemingway treated Ernest, when he was a small boy, as if he were a female baby doll and she dressed him accordingly. This arrangement was alright until Ernest got to the age when he wanted to be a "gun-toting Pawnee Bill". He began, at that time, to pull away from his mother, and never forgave her for his humiliation. The town of Oak Park, where Ernest grew up, was very old fashioned and quite religious. The townspeople forbad the word "virgin" from appearing in school books, and the word "breast" was questioned, though it appeared in the Bible.